Man Made Global Warming Climate Change Caused by Human Bias? In the following graph the BLUE line is RAW temperature data while the line RED is HUMAN ADJUSTED homogenized/mixed data” of Darwin Airport in Australia. You can see the RED line take an upward swing showing “warming” while the blue line shows a slight cooling trend overall. The RED ADJUSTED data shows HUMAN BIAS introduced by the calculations of the alleged climate scientists. Human bias creates “man made global warming”! The black line shows their ever increasing biased adjustments to get their data inline with their political agenda (possibly done subconsciously or possibly consciously – not sure which is actually worse, fraud or incompetence). Yes, global warming climate change is man made in the sense that human bias creates global warming climate change and not the life giving essential plant nutrient CO2 as this graph clearly shows! CO2 is cleared of guilt as are humans (except for those biased alleged climate scientists and activists who are guilty of inciting mass panic yelling fire)! Amazing! 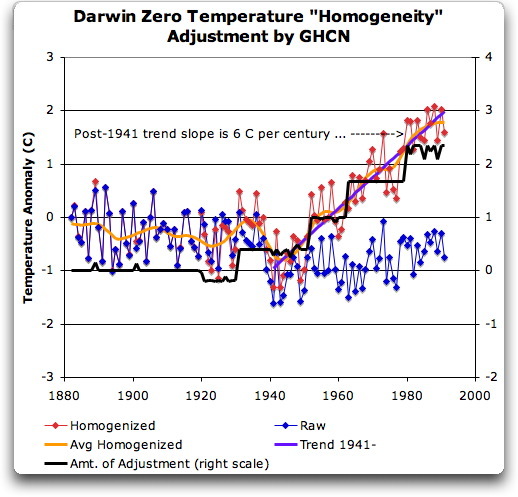 The graph is from Willis Eschenbach’s analysis of one temperature station which he calls “Darwin Zero Before and After”  (be sure to read all three of his articles on this topic – the original  and the two updates [3,4] – see reference links below). What it shows – baring a better explanation – is that human bias of the alleged climate scientists involved in computing the weather statistics adjustments for Australia is what is causing warming in Australia. This is a common pattern that seems to be emerging in many stations around the world as further analysis of them is done. Adjusted and massaged and homogenized data that when raw is neutral or cooling or very small warming trend but when adjusted takes a major hike upwards towards “man made warming” caused by “human bias” not CO2! Devastating if this stands up to further analysis. Of course calling it “human bias” assumes that it wasn’t adjusted upwards with a “nefarious” purpose. Since the Climategate emails, programs and data were released that is an assumption that is very difficult to make since “nefarious” purposes towards a “pro AGW hypothesis” has now been proven by many alleged climate scientists (likely over 42 of them in the Jones, Mann, et. al. in-bred group). (1) The Smoking Gun At Darwin Zero by Willis Eschenbach. (2) Scepticism’s limits – uncredited Economist rebuttal to (1). (3) Willis: Reply to the Economist by Willis Eschenbach. (4) Darwin Zero Before and After by Willis Eschenbach. This entry was posted on December 21, 2009 at 3:17 am	and is filed under Climate Science, Complex Systems, Debunking Bad Environmentalism, Hard Science, Hard Science Required, Humbled by Nature, Ignorance to Knowledge, Proofs, Rational Thinking, Reality Based Environmentalism, Science over Propaganada, They got the math wrong!. You can follow any responses to this entry through the RSS 2.0 feed. You can leave a response, or trackback from your own site.